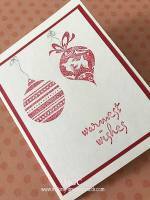 You can use card making embellishments like ribbons, paper flowers, colourful gemstones and stickers to add interest to your handmade cards. 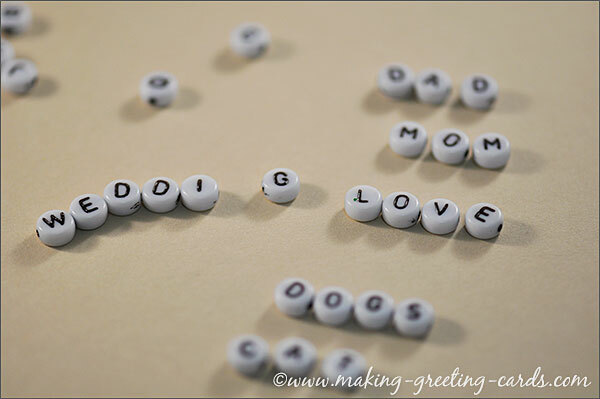 These are usually found in scrapbooking stores and crafters are crazy over these stuff and use them in their scrapbooking pages and handmade greeting cards to add sparkle or 3D effect to their creations. 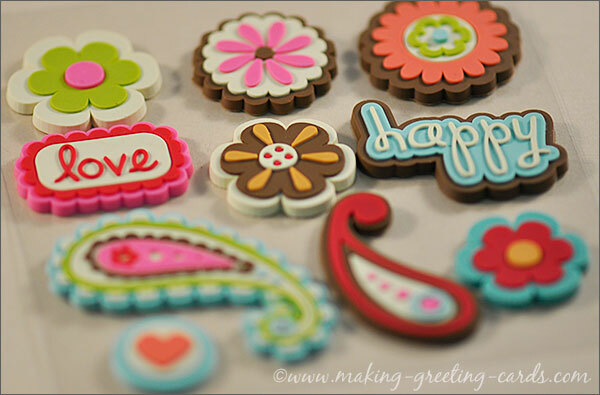 Below are some card making embellishments; beads, colour stones, stickers, eyelets, ribbon, paper and silk flowers and buttons. 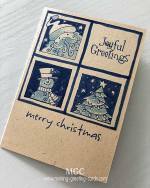 You will definitely want to add these to your collection of card making supplies to glue or sew onto your greeting cards. 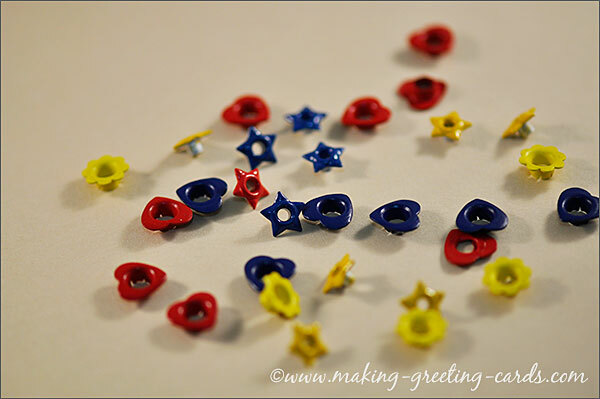 Buttons of various shapes and colours can be found in your sewing box. 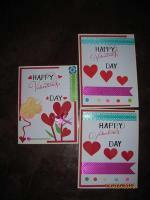 These are great for baby or vintage cards. I have a big box of these in a plastic box which was meant for storing beads. Tips: Before you throw out your old clothes, look for buttons and other decorative items that might be sewn or attached to the clothes. Another good source for card embellishments is in your trinket box - costume jeweleries that you do not wear and want to throw away. String a name or word(s) e.g. "B-A-B-Y", "N-E-W-L-Y--W-E-D" for a baby, wedding or birthday card. Use jewelry-making string as they are stronger than normal sewing thread. Tie a knot at both ends. Make a bow with a ribbon and attach to your handmade card. 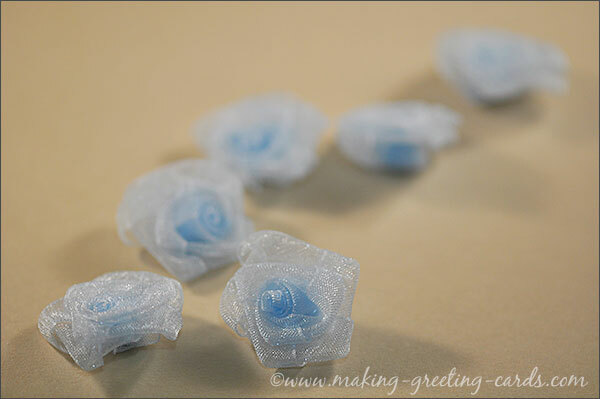 The Shoe Card is an example of using ribbons to embellish your homemade cards. Eyelets are not just pretty but they are also useful for attaching vellum or layers of cards together. 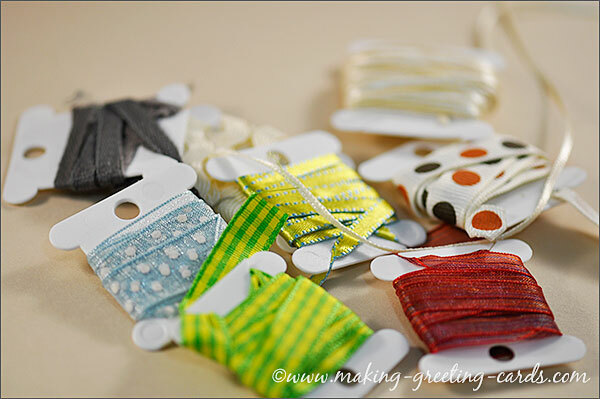 You also can use these on tags as re-enforcement rings to thread the ribbons or strings. 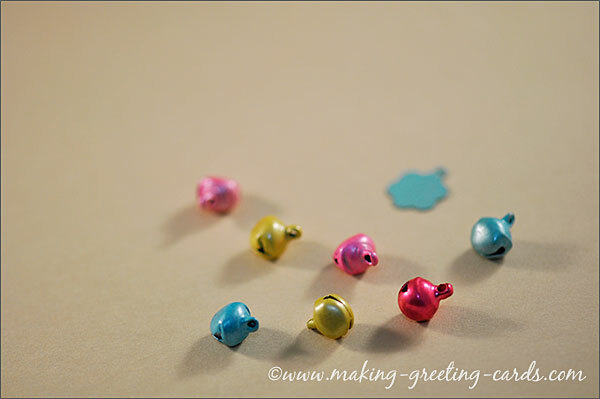 These tiny colourful bells will make your cards go a-tinkling when the recipient hold it in their hands. 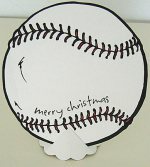 Attach to your cards with strings or thin ribbons. 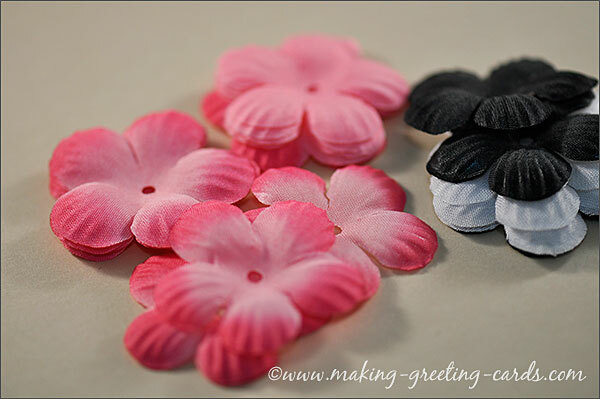 Flowers are made of many kinds of materials; for example, fabric, paper and silk. 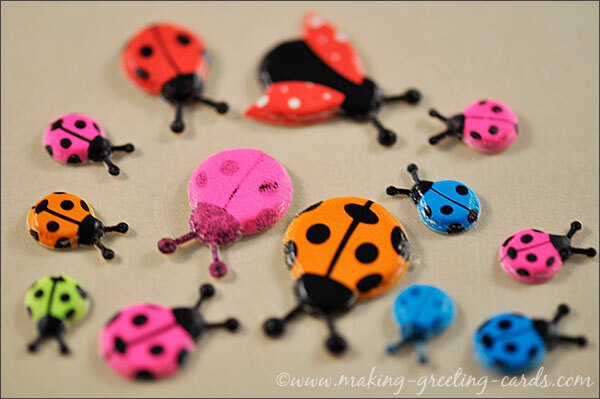 This is one of crafters favourite card-making embellishments. 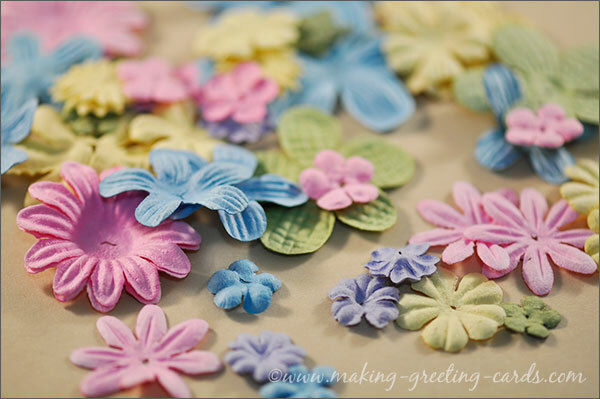 Great for spring cards. 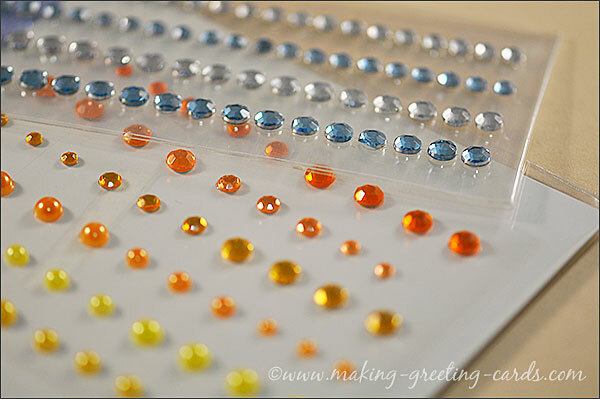 These stick-on embellishments for card making are my favourite of adding sparkles to my homemade cards. They are easy to use as they come with sticky backs so you just peel them off from the plastic sheet and press them onto your card. 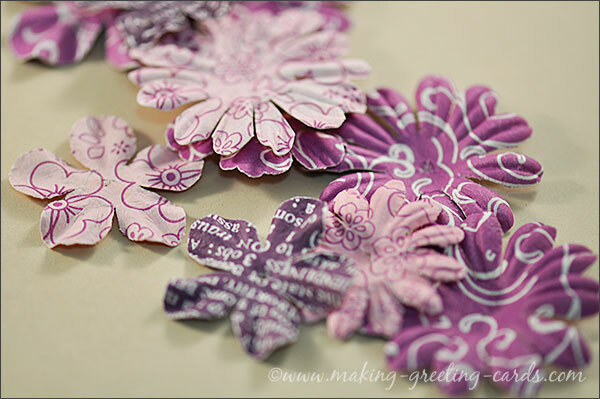 Use a pair of tweezers to pick them up and transfer to adorn your card design. 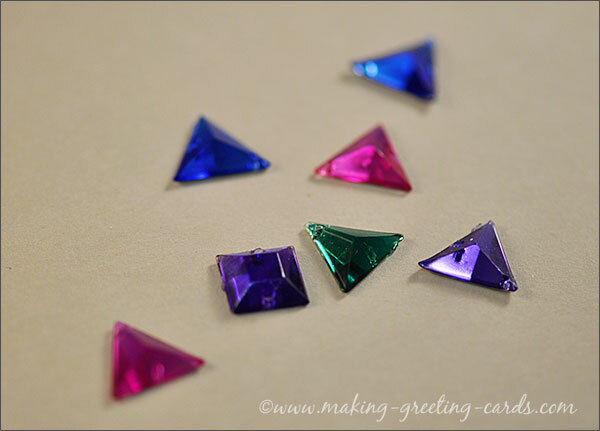 These do not have any sticky back but rather they have holes on the corners so you can use rings, wires or threads to attach them to your creations. Ain't these stickers lovely? These were given to me as part of a gift and I just love them so much. Have yet to use them in my cards.